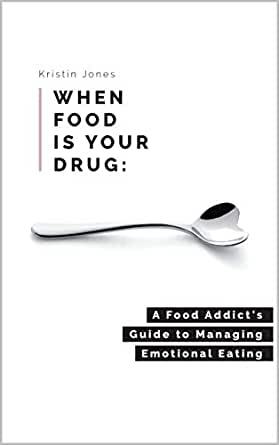 When Food Is Your Drug empowers readers to take control of not only their relationship with food, but more importantly, their relationship with themselves. When that relationship is in a good place, all other relationships flourish and thrive. Now is the time to get all of your relationships healthy and When Food Is Your Drug takes you step by step through how to do that. Follow the advice in this book and be free from obsessing about food, calories, and your weight. 5.0 out of 5 starsBe brave enough to SERVE yourself. Do I eat when I'm bored? Yes. Do I eat when I'm stressed? Yes! Do I reward myself with food? YES! 5.0 out of 5 starsInteractive HOPE!!! If you think you might have a dysfunctional relationship with food, then this book is for you! Unlike other books with tips and quick fixes aimed to help one lose weight, this guide cuts straight to the root of weight issues that exist unconsciously and wreak havoc on our lives. Addiction is rooted in our desire to feel "in control", and those behaviors that we use to avoid uncomfortable and seemingly intolerable feelings are merely a symptom of a much deeper problem. You are invited on a journey to self-awareness and self-discovery when you engage with Kristin’s book. The perennial teacher, Kristin's guide is interactive - she offers plenty of opportunities to digest the material she presents so that you can truly face your habits that contribute to your dysfunctional relationship to food and block you from experiencing joy and abundance in your daily life. The return on your serenity quotient is directly proportionate to your willingness to take the time to interact with her book. The journey to freedom isn’t easy, but it is entirely worth it! Grab your journal and get ready to meet yourself. You will not journey alone as Kristin transparently shares her personal experiences of how she came face-to-face with her own addiction to food and how she actively participated in her recovery from her dysfunctional relationship to food. This book is about supporting your journey to rewriting a healthier relationship to food. She has already been on this journey, so she empathizes with the degree of difficulty you face. You can lean in and trust that she will hold your hand all the way through. Simply put, recovery is a lifestyle overhaul that requires us to face our perceived boogeymen....even if we feel like might spontaneously combust in the process. Gummy bears bring instant relief, but lasting peace transpires when we become willing to open the closet door and come face to face with the scary monster we believe might be lurking there. 5.0 out of 5 starsThis Book Can Change Your Life! As a published author, English professor, and avid reader, I am pretty critical of writers and a damn good judge of good writing. I read Kris's book with an eye practiced at reading and critiquing papers and novels of all sort. This book isn't just well-written...it comes from her heart and you can HEAR her voice, FEEL her pain, and UNDERSTAND the struggles she's had on her journey to writing it. If you have food issues of ANY kind, do yourself a favor and pick this up. Her journal questions alone will open doors you didn't even know were there. 5.0 out of 5 starsA must read for anyone looking for a healthy relationship with food! ‘When Food Is Your Drug’ was one of the few Self Help books that I could not put down. The way that Kristin became completely vulnerable with her own story, just drew you into the book. It was the perfect mix of raw emotion, interactive activities, self reflection, and solutions. I loved how she circled back, many times to the fact that blaming our parents for things that happened in our childhood was not the way to fix our future. That now, it was us in control, and although the thoughts may be very strong and real, that we can retrain our brain to think differently. Whether you are an emotional eater or have other issues, that you would like to work through this book is for you. Be ready to do some work, but also realize that you can move on to a healthier, happier life, with Kristin’s guidance and this book. 5.0 out of 5 starsFood is becoming my friend, no longer my foe (drug)! My battle with emotional eating parallels this author’s. In Kristin’s book, When Food is your Drug”, I could identify with almost all of her personal accounts. I have probably purchased 75% of all the diet books available throughout my lifetime. These books presented a passive plan I could read and follow and be successful, but not keep the weight off. The difference with this book is in the use of the journaling process. Each of the exercises completed is like peeling an onion. Each layer (exercise) reveals a variable that is necessary to uncover as we move closer to the core and learn what needs we are trying to meet through food. I especially liked the fact that Kristin realized the impact of these discoveries on our emotions and at times has us set our journals aside and let the new knowledge permeate deep within our bodies, minds and spirits and then come back to the exercise. After completing just a few of the exercises, I found myself being mindful about when and why I was eating and analyzing my best choice of food to eat, if hungry or doing a non-food related activity. Initially the affirmations seemed rote and useless or powerless, however, after recording them on my phone for instant playback, I found them to have a positive effect all my thought processes. “Me Time” was the hardest for me to implement as I would rather give than receive, Kristin’s explanation about the power of “Me Time” challenged me to prove her wrong. Well, let me tell you, I was wrong! I found that by taking care of my needs first, the rest of the day I can give to others with greater efficiency. Today I am noticeably healthier and happier than ever. I’m in the process of making food my friend, not my foe!